Brown Foliage. In my experience, the fern will maintain its handsome looks for only a year or two before its leaves wither and brown in a Victorian death scene. Browning usually occurs when the rhizomes have grown so thickly matted that water can not penetrate the roots beneath them. To restore the plant to good health, do what I do, and either propagate small sections of rhizomes, or divide the plant into several new ones. First, knock the plant from its pot. 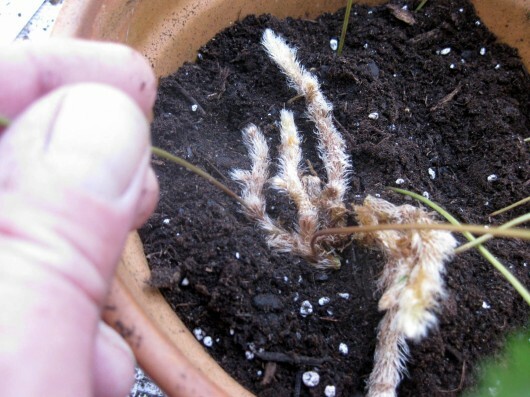 If it won’t dislodge easily, cut off any rhizomes which cling to the sides of the pot. Cutting these “feet” will seem rather cruel, especially if you’re accustomed to “petting” them on a regular basis. Next, using hand pruners, cut off two- or three-inch sections of rhizomes which have fresh green leaves attached. They should resemble those in the picture above. Finally, fill a crocked, clay pot with soil (again, this should be well-draining), and then pin the rhizomes to the surface of the mix. I use bent pieces of 22-gauge wire for pinning; a bent “bobby-pin” will work as well. In any event, do not bury the furry feet, or they will rot. And be sure to use a shallow pot, for fejeensis does not have deep roots. 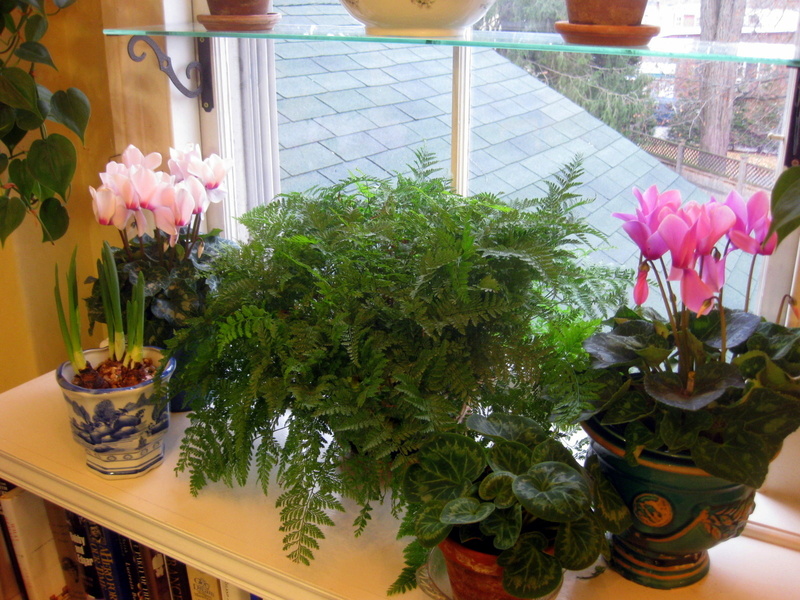 I use bulb pans and also “azalea” pots to accommodate the fern’s propagation. Placed in bright light (no direct sun, please), or beneath fluorescent lights if you have them, the rhizomes will form roots. Rooting will be evident when new growth emerges. Propagation by Division. 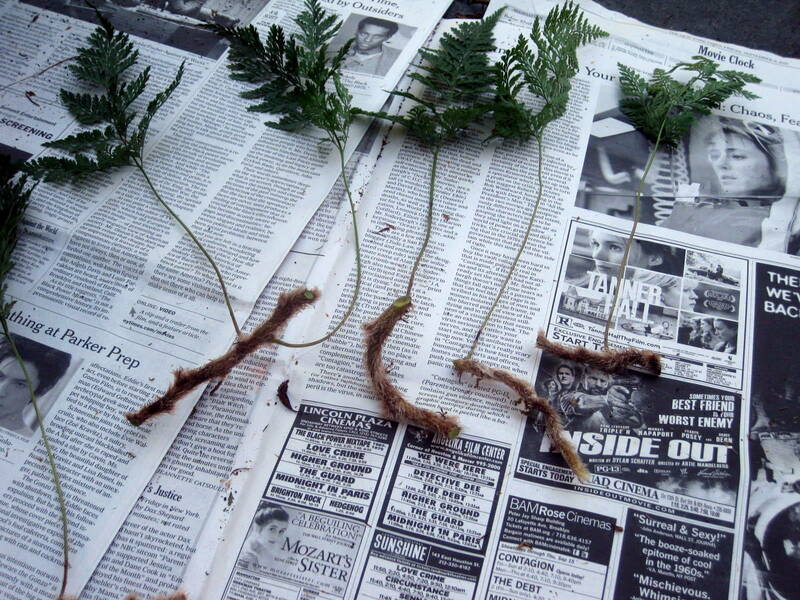 Now, if pinning rhizomes to soil seems like too much work, you can simply divide the fern into two or more plants. Follow the exact same procedure I described in detail for dividing the Boston fern. Just be sure to pot the divisions so rhizomes are located above the soil line, not beneath it. No matter your age, I promise you’ll feel much, much younger in the presence of Davallia fejeensis. For it is one of the oldest plants on earth. Some botanists believe this fern predates the dinosaur. Now that’s a conversation-starter! Funny posted my comment before looking at you tutorial! You did what i did to mine. Awesome, and I will be bookmarking this! Got a rabbit's foot fern several years ago, and it's done pretty well… occasional brown and dropping leaves, but it's happy hanging from my dining room chandelier! Plenty of light, even if it's artificial, I guess. Gen – Fejeensis hanging from a chandelier? What a gorgeous sight! Actually, before the invention of fluorescents in the late 1930s, lots of indoor gardeners grew foliage plants — philodendron and grape ivy among them — beneath incandescent lamps. Savvy lamp-makers of that period even designed standing lamps with brackets attached for plants. So your chandelier-idea is not only a good one, but it has historical precedence too! What a great article! I'm glad you are getting good results from the Miracid plant food using the constant feeding method. Have you tried that same method using the Miracle Gro All Purpose Plant Food? It has a neutral pH, instead of the acidifying reaction of the Miracid. Rabbit's Foot Ferns tend to thrive best in a soil pH of 6.5 to 7.5, which is nearly neutral. Wendy – My Davallias have flourished with the pinch of miracid I give them with each watering between Jan. and Sept. Good to know they will also thrive in soil that has a mostly-neutral pH. Hi Roxy – If the furry rhizomes are still healthy, meaning they are not completely dried out, just cut them into 2- to 3-inch segments. Pin the segments on the surface of damp potting mix. The rhizomes should sprout new growth in about a month. We’ve always called them Monkey Tail Ferns. Do you know where to buy rabbit’s foot ferns online? After seeing yours, I want one. 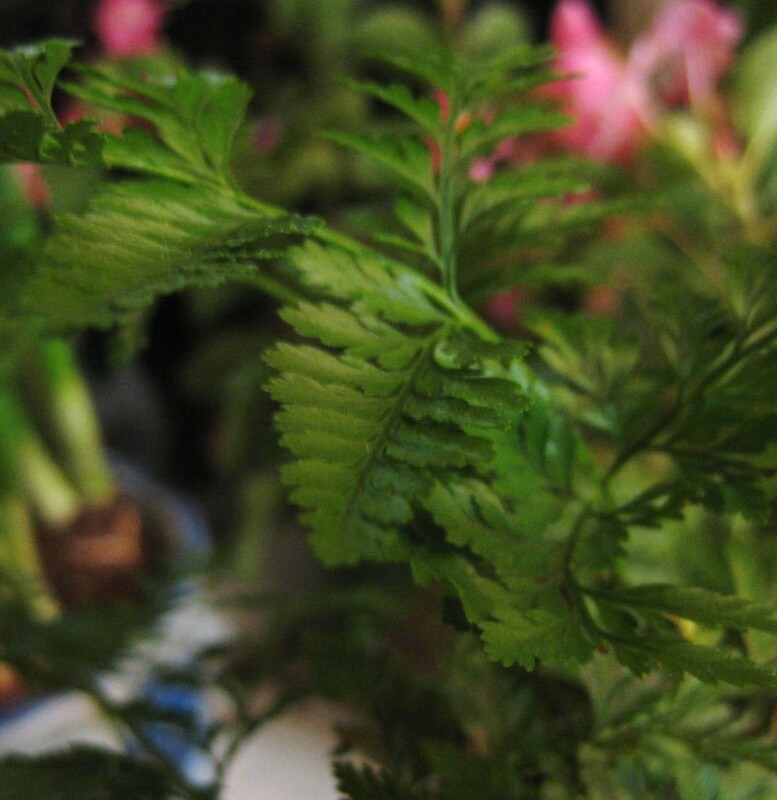 Hi Diana – Off the top of my head, I don’t know a mail-order source for this beautiful fern. My original plant came from a local florist’s shop — I asked them to order it. Your own local florist will probably leap at the chance to order one for you, too! 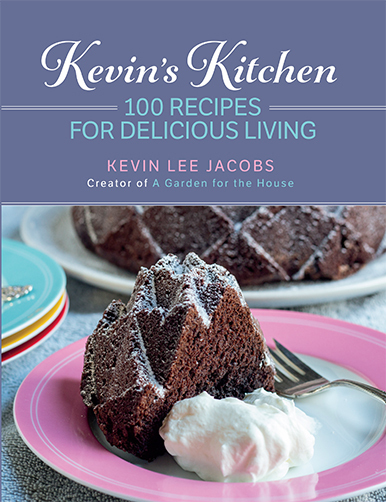 Kevin, you are a wealth of knowledge: from violets to cupcakes to seedlings, even to history. Thank you for generously sharing a wealth that has come from study AND experience which equals = wisdom and insight. I got mine at a craft sale in NH about 15 years ago. I divided it into three several years ago and they are thriving. They all need to be divided again! I just forgot how long it takes for them to establish after being divided so that they look as full and lush again, as your does. It would be nice to give some away, as I am running out of room for them. I keep them in a bathtub we don’t use, which is next to several windows so they get great natural light. It’s convenient because they occasionally drop a fine brown powder and being in the tub, it’s easy to clean up (and water them). Do you know what that is and why that happens? I feel I need to advise those who receive the divided plants. Thanks for any information! I brought a Rabbit’s foot fern back to my home in Virginia a couple of years ago. I purchased it at a friend’s greenhouse in Iowa. I love that fern-maybe because that was my Mother’s name. It is now doing very poorly and after reading the great information and comments at this web site, I think I can return it to a better state with more plants that I can share with others. Thanks so very much for all your comments which give me hopes to be successful in reviving my plant..
My fern is leaving a powdery sticky residue all over everything. Any suggestions? About that ‘buying then online’….I just got one for my birthday, but I was tasked with finding one…..I did….Amazon sells them in 1 gallon size for 23 dollars! I have one of these beauties that was my grandmother’s, so its name is Alice. My estimation is that it’s about 55 years old, because I remember it as an early teen. The diameter is about 18″ at the top. You won’t believe it – it’s been in the same pot for years – an awful, pinky-beige styrofoam number that was the precursor to the pressed and coated styro ones we have now. Alice has been in many climates, was outside when I lived on the coast or a temperate inland zone, but now I’m in a cold-winter area, so I bring it in for the winter. It gets light all-purpose fertilizer several times a year, water at least twice a week in the summer, as well as misting. bar-b-q skewer. Believe me, I baby this plant as much as I can, but I’ve always been reluctant to “fix” it, because it’s big and thriving. The only times it’s looked a little sad is when I neglected the watering and fertilizing, but it bounces back fast. Please help, I’ve had a Rabbits foot fern for many, many years, and it has looked bad for many years, but it’s not dead. It is all “feet” and only a few fronds…They are such beautiful plants, I would love to bring it back to what it should look like. Is that possible, and how can I make that happen? Thank you! Hi Susan – Do as I did in the article above, and propagate the “feet.” You’ll soon have fresh, young, eager-to-grow plants that look like a million bucks! I’ve had a beautiful plant, but is now down to one “foot” that’s producing. I think I’ve been overwatering. Exactly how much moisture does it need? Several people are wondering about the brown powder ferns leave behind. That is the fern’s spores. They can be sprouted, but it would probably be better to propagate the plant from the furry rhizomes. The powder is just the spores. Absolutely normal healthy fern activity. They are the equivalent of microscopic seeds. just vacuum or wipe up with a damp paper towel. They come from the little brown dots on the underside of the leaves when they mature in the fall. Hope this helps. I bought my wife a rabbits foot fern over thirty years ago and up until this year it was doing great. Had a problem last year with scales, but I was able to get them off and it was doing fine. In all the years we had it, I only re-potted it once. In the warm weather months (May to Sept) we keep it outside in good light but not direct sun. In the colder months it’s in the house. This year there are only two ferns on the plant, and the rest of the plant looks terrible. The rhizomes are all very dark in color and look dead. I’ve taken the plant out of the pot and took off only the rhizomes that look healthy and re-potted as you mention in the article. I’m hoping it comes back. We’ve had it for so long. 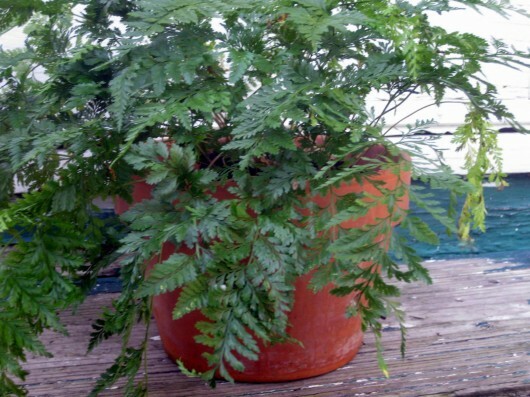 I got a rabbits-foot fern a month or so ago and would like to put it in a different container. Will it do well in a terrarium or would it be better to re-pot it in an open container? I was thinking about something like a large, open glass container. If it should dry out some between waterings, then a terrarium might not be such a good idea, but if it should be kept moist then it might do fine. Any advice on this? 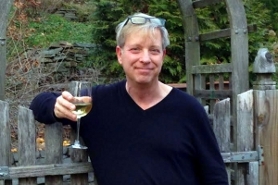 Hi P. Michael Moffa – The plant should recover for you after surgery/repotting. Good luck! Hi Patty Wall – I think Fejeensis would quickly outgrow its allotted space in a terrarium. My advice? Keep it in a pot! Kevin, if my Rabbit’s foot fern would outgrow a terrarium, what about a large glass container, say one that is 14.4 x 9.6 x 9.6, or even a large Wardian case? Kevin, on second thought, width of only 9.6″ would not be wide enough, but again to my question of a Wardian case? If that won’t do, I have a lovely ceramic pot I can transplant it to. What do you advise? I bought a rabbits foot fern several months ago-but it isn’t a ferm it has solid leaves that have a very nice shape. But it isnt a fern. Are you familiar with this? Hi Jo An – I’m not familiar with a rabbits foot fern that isn’t a fern. Do you know the botanical name of your plant? I love petunias, but when I purchased them last year (doubles), they were covered in aphids within a few weeks. This year I purchased calibrochia and they too are covered in aphids. Did a garlic spray and watered them as best I can. I’m in a townhouse and no hose up this high. The garlic spray helped but they really looked bad and just recently bought neem oil and sprayed them again. I can still see the green little ****s on the flowers, but they aren’t moving. Any suggestions? Also Kevin, what should I use before bringing outside flowers inside for winter? I want petunias and calibrochia (million bells) inside and would love to try your technique. 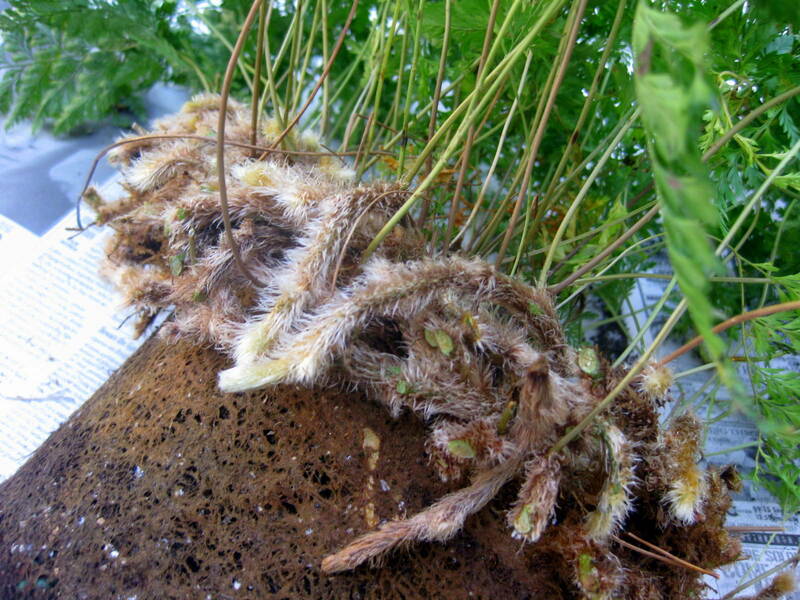 Jo an, there are different types of rabbit foot ferns that have different leaf shapes. I have one with a solid leaf, and one with a lacy leaf. I am glad to see the comments are current. I just repotted a rabbit’s fern that belonged to my mom who died at age 98. It was gorgeous and I want to keep it as a memory of her. I looked and looked at all the websites, and so far, this has been the best one. So thanks, everyone. Hello I’m trying the rhizome repotting method but I partially buried the rizhomes (top of rhizomes exposed to air) in order for them to stay put. I did not have pins to pin them down. Will that work as well or a major no-no? Thank you. What are the little brown spots on underside of the leaves. Through the winter inside it has a brown dust on the floor around it. Why is my rabbit foot Fern getting a few yellow leaves, not brown?